In around 100 days I will take on the biggest challenge of my life at the London2Brighton 100k challenge. 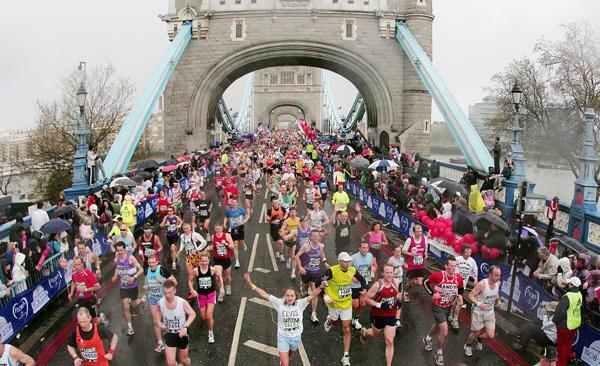 But my first foray into the murky world of long distance running was and probably always will be the greatest – the London Marathon. Prior to entering, I had supported a couple of friends as they took on the 26.2 miles from the start in Greenwich, across Tower Bridge and after an exhausting middle stretch finally along to the glorious finish on The Mall. Even finding a spot in the crowd was hard as family, friends and well-wishers pushed up against the fence, 2 or 3 deep at some points. 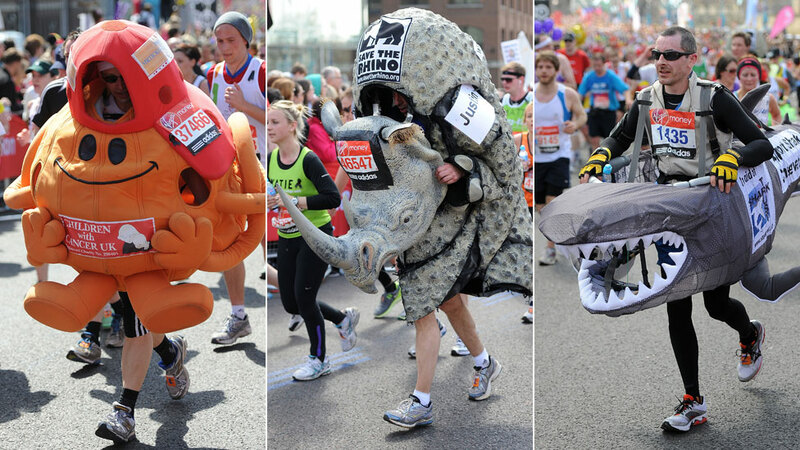 There were children and adults, dressed in crazy costumes and bright colours, carrying banners, blowing whistles and screaming loudly as they looked for their runner amongst the rhinos, wombles, Wonder Women and normal athletes. What struck me was the wave of goodwill directed all runners and especially those showing signs of tiring. The additional noise for anyone struggling was incredible, like a Mexican wave of support, pushing them on to the finish line. I knew from that point that I had to be part of it. 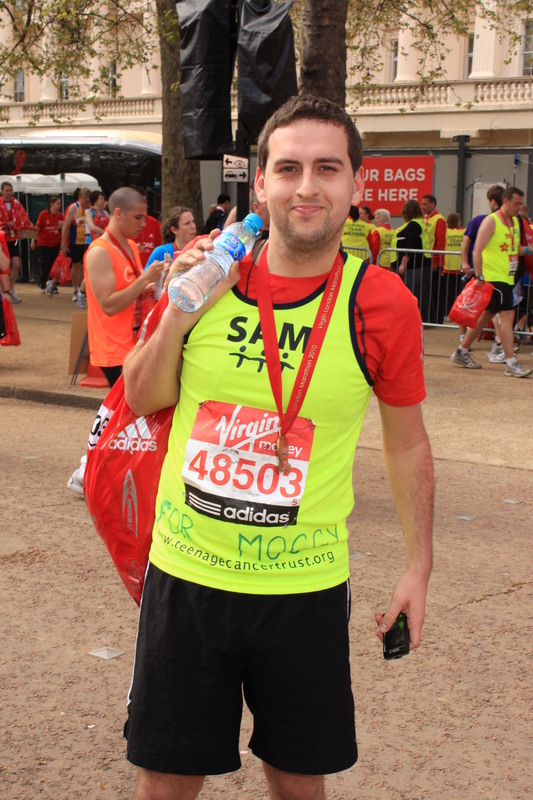 In 2010, I took the plunge and put my name down as a charity runner for the Teenage Cancer Trust and a little over eight months later, there I was on the start line in my lucky red top with a luminous vest bearing my name on top. At the beginning, my training seemed simple and I went from targeting a four hour finish to aiming for a 3:30 finish and increased my mileage accordingly. This is the point that both of my knees decided to give up and I fell into the large portion of the Venn diagram who had encountered the dreaded “Runner’s Knee”. Complete rest, constant physio and massages got me to a month before the race with no pain but also no training. I hadn’t completed a run of over 13 miles in the lead up to the event but I wasn’t worried. All I had to do was keep going. If a man in a diving suit, dressed as toilets and sharks can get round, I must be able to it. The morning itself starts early with porridge, bagel and a cold walk to the DLR station. The platform and train were busy with men and women all lost in their own world, wrapped in sportswear and headphones already on to psyche themselves up. As I left Greenwich DLR station, I fell into line with the throngs making their way through backstreets, already spying costumes and fun runners. Well, fun runners is an odd name for them. Running just under 30 miles is foolhardy enough but to do it in an outfit on a potential sunny spring day? There should be a mental test when you sign up for it. The final moments in the park are mainly pre-occupied with the logistics of dropping your bag, finding the start and most importantly, looking for the shortest toilet queue. Looking down at the river of bright crowd of colours stretched out in in front and behind you (in my case mainly in front), the size of the event hits you. Phone checked, headphones inserted and watch primed, this is the moment it has all been building to…and then, nothing happens. It was almost 10 minutes before I actually made it to the start line but as I got closer and closer, something else was building. You could hear the noise from the crowd before you could see them, so much so that I decided to keep my headphones out so that I could what was going on; I never put them back in. The race not only lived up to my expectations but surpassed them more than I could imagine. The route was lined with bands, dancers and most importantly, members of the public offering jelly babies, bananas and jaffa cakes to keep you going. Shouts of encouragement from everywhere and whistles and those banging sticks and drums and singing and dancing; just an incredible musical warmth. The final turn is a feeling that will never leave you. I still well up now as I run past the turning and think about the emotions I was going through that day. The elation of the final yards down the Mall in front of Buckingham Palace is incomparable (despite the look on my face). a) the adrenaline gets to everyone, you will run faster at the beginning than you meant to. SLOW DOWN. And finally, remember everything, it is an incredible moment.